Tags: book review, history, LIBR 264, national geographic, rosalyn schanzer, The absolutely true tale of disaster in salem, The Scarlet Letter, tween, witches! Schanzer, R. (2011). Witches! The absolutely true tale of Disaster in Salem. Des Moines, IA: National Geographic. A great non-fiction title for tweens! Witches! The Absolutely True Tale of Disaster in Salem is a National Geographic book for young a reader and a 2012 Robert F. Siebert Honor book that presents the complex story of the Salem Witch Trials in a thorough, respectable, and a manner which is enjoyable to read. The author also provides unique scratchboard illustrations mainly of black and white with red highlights that give an old, primitive appeal to them. This short yet very informative book, is truly interesting, and the pictures perfectly align with the story and time frame in which it was set. Rosalyn Schanzer presents an easy to understand story without the need for excessively graphic detail in an informative, yet story-like fashion. Witches! 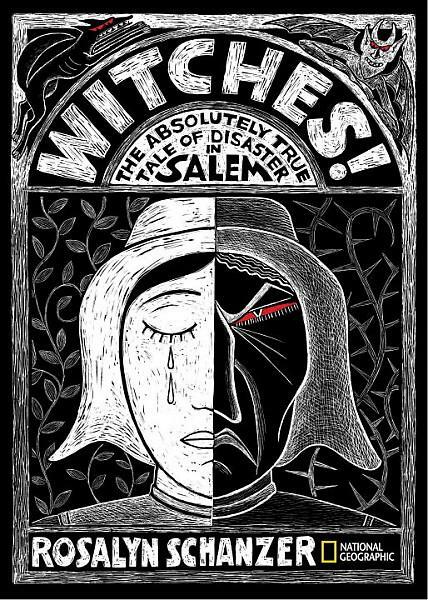 The Absolutely True Tale of Disaster in Salem, nicely presents in a highly segmented manner the major participants in the Salem Witch Trials, the order in which they appeared historically, descriptions of each, and the part they played during those events. Witches! The Absolutely True Tale of Disaster in Salem features primary source accounts to display the impact the victims, accused witches, and corrupt officials impacted this Puritan society. Each chapter focuses on either the initial incident, the accusers, the judges, or the accused. The citations from the actual court trials are a very enjoyable addition to the book’s accuracy in this historical account of the 1692 infamous Salem Witch Trials. Prior to any accusations and witch trials, two young girls began to twist, contort, ache in pain, and grumbled. After the local doctor attempted all he knew of, his diagnosis resorted to the girls being victims of a bewitchment. From there, accusations were made of strangers, widowers indigenous persons, non-church attendee, etc. of consorting with the devil, which resulted in approximately 20 people killed and hundreds of lives destroyed in the crossfire. There’s no doubt that the subject matter can be depressing or hard to read. Especially reading how cruel people were, murdering innocent women because of prejudice, jealously, and various other trivial matters. Even worse, this was all done in the name of religion and for the sake of children. Regardless, this is a part of our history, a well written book, and handy historical resource. As the story progresses, it can be hard to keep track of who’s who, but the author does provide an illustrated index of all the characters as well as time lines if point of reference is needed. For someone or students beginning to learn about the Salem Witch Trials this is an excellent introductory book. Especially prior to reading The Scarlet Letter so as to have better insight to colonial-Puritan America. Witches! The Absolutely True Tale of Disaster in Salem is an overall enjoyable and quick book to read. It’s chalk-filled with plenty of historical facts which can easily supplement class curriculum for those studying the Salem Witch Trials, those fascinated by the topic, or even someone preparing for a vacation to Salem, Massachusetts.